My client knows it is impossible that anyone could be getting into his house. This is not an isolated incident, it has happened periodically over many years, sometimes lasting months with a frequency of about twice a week. At times it fades for a few weeks, only to start happening again. As disturbing as the situation has become, my client has known for a long time there is only one explanation for the situation. It is he himself that is enjoying this feast, though he has absolutely no memory of it whatsoever. He even went to the extreme of weighing himself before sleeping and on waking up to look for weight shifts. It was evident that the sources of stress in my client's life had increased significantly in recent years. Although he hed raised a daughter alone, he had had a life relatively free from tension up until the teen years of one of his daughters who had acted out quite severely in her teens, until finding her path. She is now an acclaimed singer in her own right. She did however provide a good deal of grief, particularly as a fifteen year old. Although his daughter came through this period relatively unharmed, her father would wait up many nights generally at weekends, waiting for her to arrive home. He would wait up in the kitchen, sometimes preparing the most elaborate dishes. He found this kept him awake and took his mind off whatever was happening to his daughter. In hypnosis it became evident that the later feelings of insecurity and anxiety were triggering a repeat of these lonely nightly vigils. It was a behavior that had served him well in the past. His mind simply decided to re-enact the same activity to deal with the new and unrelated stresses of his life. He was quite literally still sitting up at night waiting for his teenage daughter to come safely home. The fact that she has been married for the last twenty years to a loving husband in California was something his subconscious mind had conveniently overlooked in its desire to find a coping tool for stress. Nail biting is an unattractive habit at any age and for both sexes. Some people have such a bad habit that they bite down beyond the quick causing bleeding and discomfort. It is also most unhygienic for someone to keep putting their fingers in their mouth transferring germs from the outside. 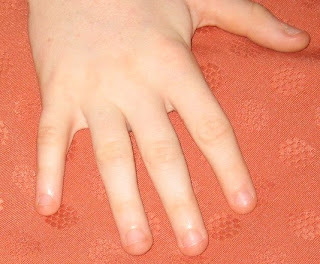 Long-term, nail-biting causes stunted nails and poor nail growth. The habit often starts in childhood and carries on into adulthood, especially for anyone suffering from stress or anxiety. Nail-biting is a habit which can easily be stopped with hypnotherapy. Hypnotic trance is a perfectly natural and safe form of deep physical and mental relaxation in which positive suggestions are fed to the unconscious mind which is controlling the habit and causing the person to keep nail biting. By changing the suggestions in a relaxing way, the person stops nail biting without difficulty. The negative habit can also be replaced with a more positive habit eg one finger gently stroking the other hand. 1. To have the person visualize their new long, healthy nails and for that image to be so powerful that the conscious desire to show off the attractive nails is stronger than the unconscious need which is causing the nail-biting habit. "I want you to listen to exactly what I say. In a few moments ... I will ask you ... to put your finger in your mouth ... just as you do ... when you are biting your nails. As soon as you put your finger in your mouth ... it will taste so bitter ... and vile ... sickeningly vile ... that you will IMMEDIATELY remove your finger ... from your mouth. Whenever you put your finger ... into your mouth ... with the intention of biting your nails ... you will experience this same feeling. Now put your finger into your mouth. Notice how sickening it tastes ... notice just how vile ... and nauseating it tastes. You just have to take your finger from out of your mouth now! Remember ... if you should ever put your finger in your mouth again ... with the intention of ... biting your nails ... it will always taste so sickeningly vile ... and nauseating ... that you will immediately remove it ... and you will never bite your nails again!" 3. Another technique is using the NLP approach of parts integration ie asking one part of the unconscious mind to help the other. In all treatments, reinforcing the visualization of feeling pride at seeing long, healthy and attractive nails in the future is beneficial. 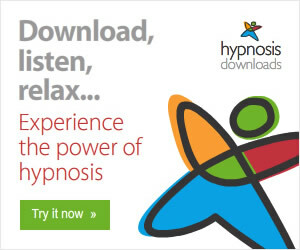 It is now possible to download hypnosis MP3 files to help with over 400 unwanted habits, health problems, phobias, sexual problems and many areas of self-improvement. Go here for a download a mp3 hypnosis file to stop nail biting. 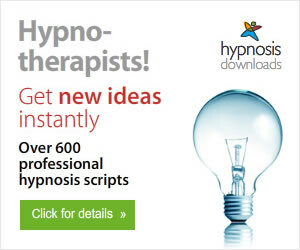 Professional hypnotherapists can also download a hypnosis script for nail biting. Stage hypnotists use such techniques but only after testing to find whether the person is a good subject for deep trance and after hypnotizing them with a longer method, taking them into deep physical and mental relaxation. The person can then be brought back into the room but re-hypnotized instantly with such techniques. Instant and rapid hypnosis inductions look dramatic but really do not have any place in a therapeutic session.